Mat and I shared the air with Istanbul, Turkey for two days last April (his 2nd visit to the city, and my 1st). Divided by the Bosphorus River, Asia sits on one side and Europe on the other. This truly is the center of the world. Turkish Airlines carried us to and from this beautiful land of intriguing individuals, colourful carpets and flavourful foods to feed your soul. Take a journey with us to Istanbul. We purchase our visas (at the airport) and for the first time in our traveling life together, an Aussie visa actually costs more than one on an American passport ($65 US for his and $20 US for mine). The faces may change, the religious dress varies and the uniform of those behind the counter is different but the pound of the stamp hitting the ink-pad and then your passport is a welcome sound that never gets old! Our taxi driver is unaware of our destination (even though he said he was). As in India, kindly, he stopped a few times to ask for directions when we got into the old city of Sultanahmet and again, the kindness of strangers got us to our hotel. Sultanahmet, the Old City, is where sites like the Blue Mosque, Hagia Sophia, Hippodrome (marbled ruins that continue to showcase history), Grand Bazaar and Basilica Cistern are located just minutes from the Bosphorus River. Our hotel is a 4/5 star hotel with a view of the eponymous monument. (All booked on American Airlines miles) Without question it is on the list of lovely hotels we’ve stayed in and would recommend it to others (for rooms, accommodations, food, service and definitely location). Just above the lobby there are computers and free Internet available for use by guests. The buffet breakfast (included) is great and kept us well fed for a good part of the day. 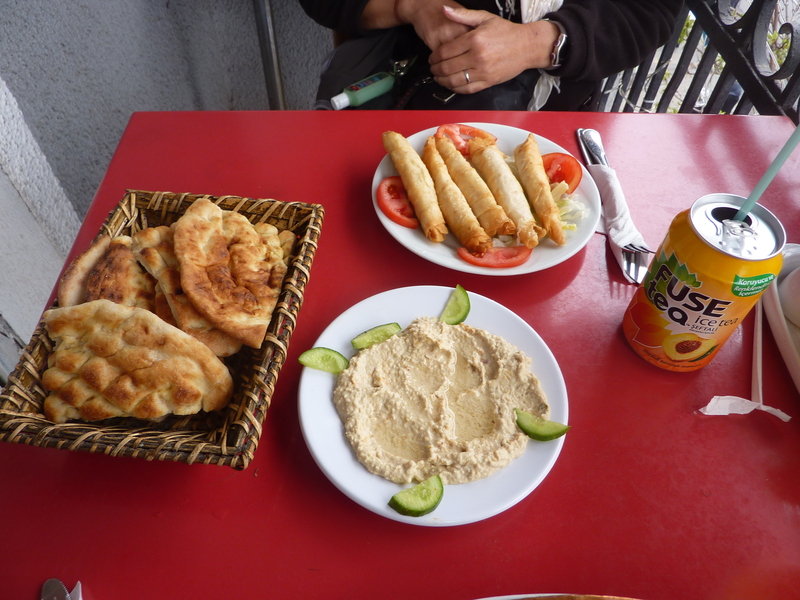 Pastries, cereal, yoghurt and the ever-present borek (which we adore at the Vic Market in Melbourne) are readily available along with delicious tea and bottomless Turkish coffee. 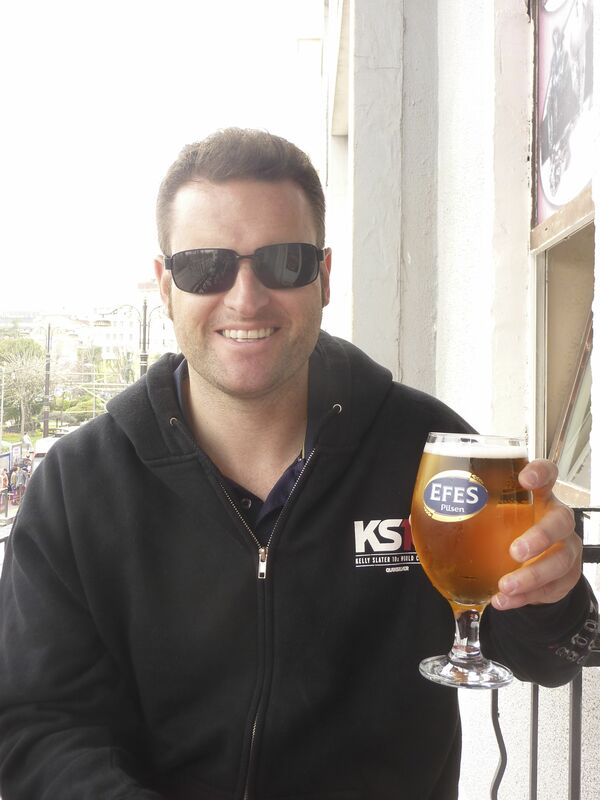 Sezamen Restsurant: Sitting on the balcony, we have a perfect view of the Blue Mosque. Hummus and spring rolls (phyllo pastry rolled with feta and herbs) for me, and the husband had his favourite, the Iskendar kebab! Service is a bit slow, but lunch is yummy. 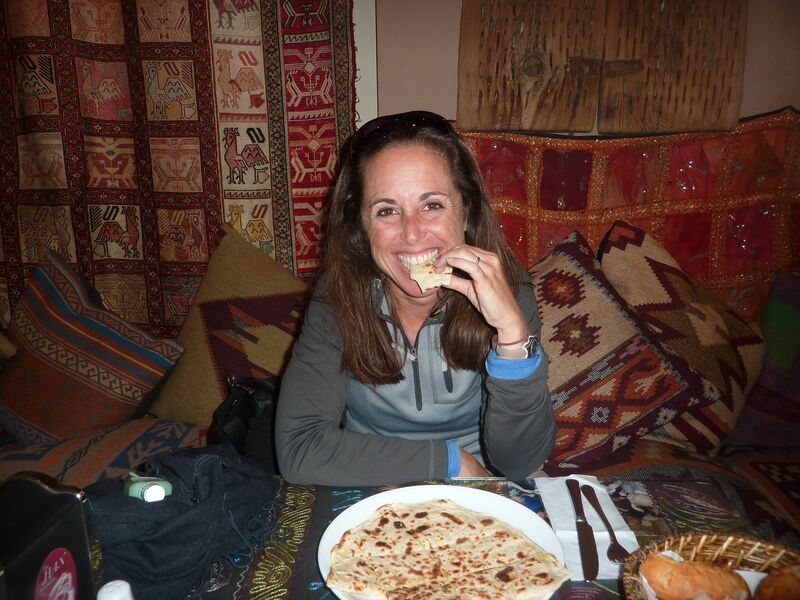 Khorasani Restaurant: We found this hidden gem due to good reviews on Lonely Planet, Urban Spoon and Trip Advisor. 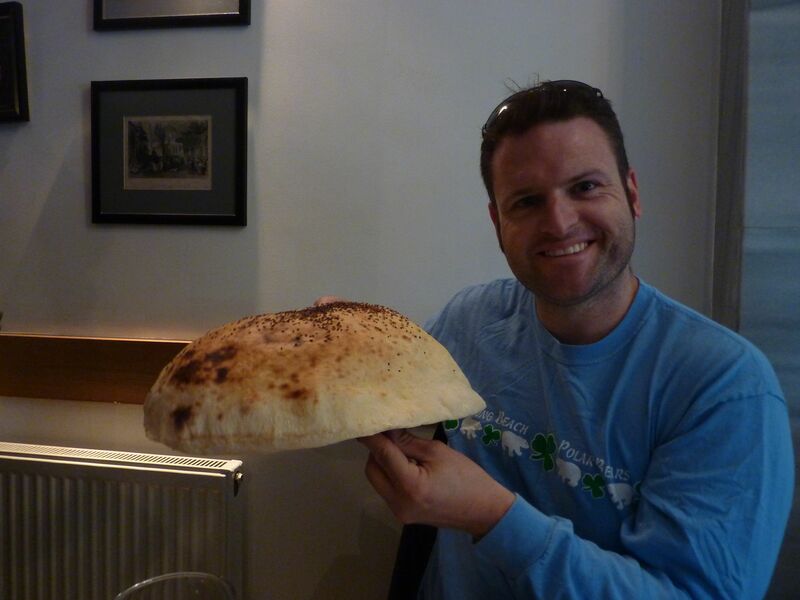 The huge puffy bread that is enormous and served with butter and Parmesan cheese is incredibly delicious. I have a grilled vegetable gozleme, (more or less a Turkish quesadilla/pancake) with heaps of flavour served with guacamole, yoghurt and harissa. The husband orders the kebab from Adama (lamb and beef on a skewer-grilled in the center of the restaurant) over bread with rice and grilled tomato along with an Efes dark. Delicious! Han (just outside the gates to go towards Topkapi Palace): In the front of the restaurant, by the windows are women pulling and rolling the breads that make the gozleme-the traditional Turkish pancakes. This is what draws us to the restaurant. Once inside there are seats on the floor with cushions in abundance. I order a potato gozleme and it’s an Iskender (Turkish for Alexander, we think) kebab for the man. It is such fun to just sit and enjoy. Fuego Cafe: For Turkish coffee and Turkish tea in the middle of a chilly afternoon. 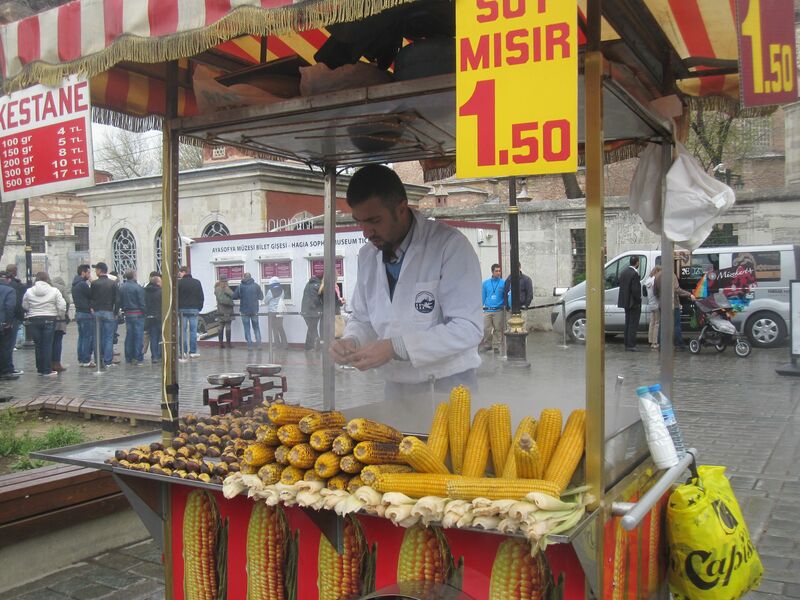 Sultanahmet feels as if all items are on a ‘tourist’ price. Where the asking price for pashminas at a market in Bangkok is $5 US, here it’s $40 and the calculator comes out quickly. 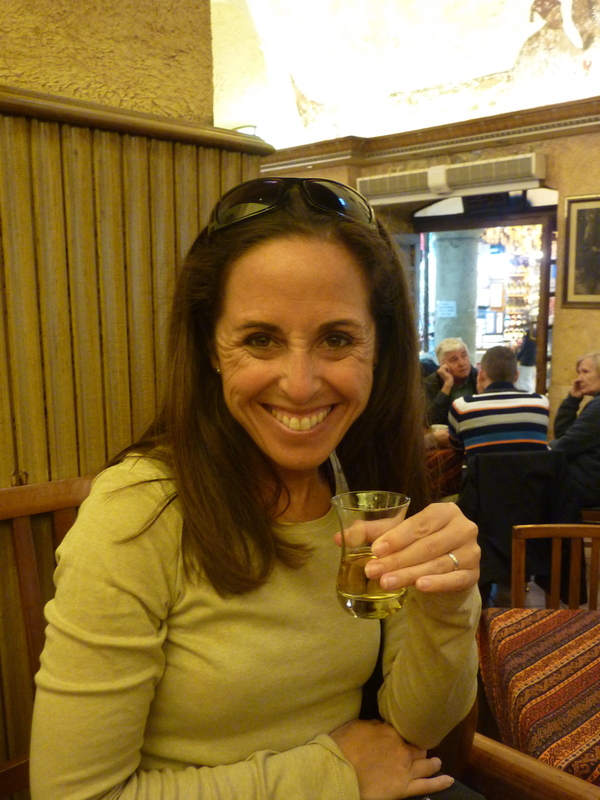 Eating out in the Old City is not as expensive as we originally thought. A lot of the markets do feel like a bit of a scam. Lots of people want to offer you tea, show you their shop and start the prices much higher than you will actually pay so the bargaining begins. 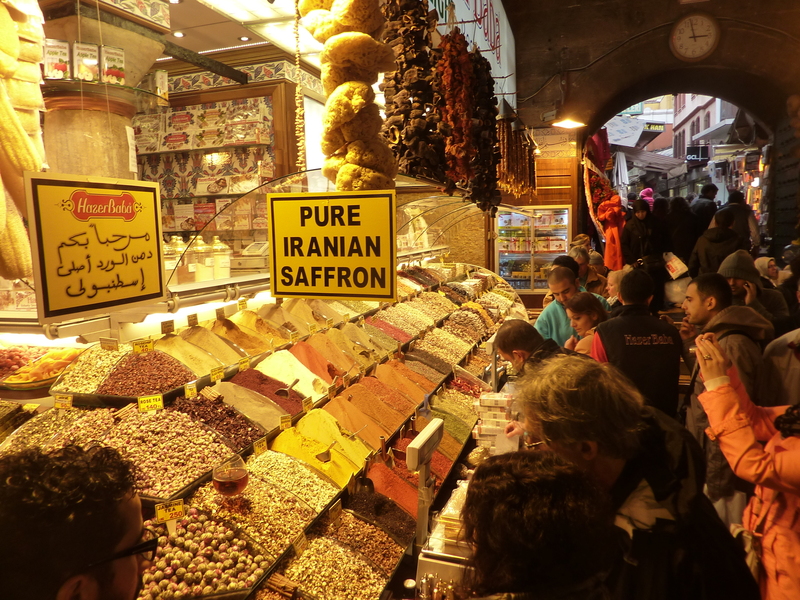 It’s different than the pushy feeling in many markets in Egypt and India-but still, more than we thought (but, it’s all part of the experience…when in Rome)! Topkapi Palace: $20 for each person; very pretty and heavily guarded (we passed on the visit due to cost). Spirograph is actually street art – can’t wait to tell my mother that the toy I spent hours with as a child is alive and well in the Middle East. The local trams (inexpensive, clean & great deal) are lovely. Turkish delights (colourful, cubed confectionary based on a merger of gel and sugar traditionally flavoured with nuts, fruits, herbs and sweets) are everywhere. 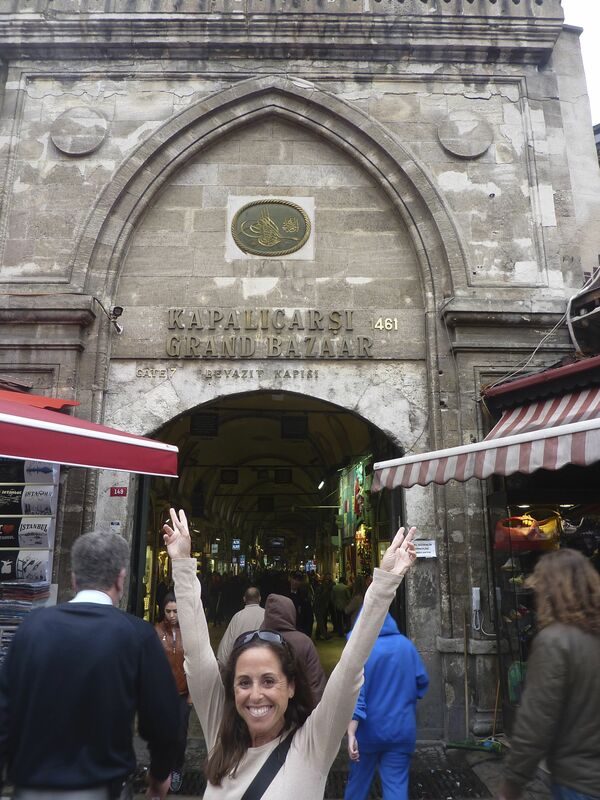 Grand Bazaar: Istanbul is known for this incredible market attraction (closed on Sundays). It is massive with wide aisles, gorgeous architecture and filled with tons of vendors trying to sell their wares (exudes the essence of the market scenes in Aladdin)! Pashminas, scarves, carpets, leather, shoes, jewelry, pottery and much more and of course, people are all on display at the market. Throughout the market, prices are higher than expected (street prices were cheaper) but wandering and window-shopping is enough for us. In the center of the market is a café. 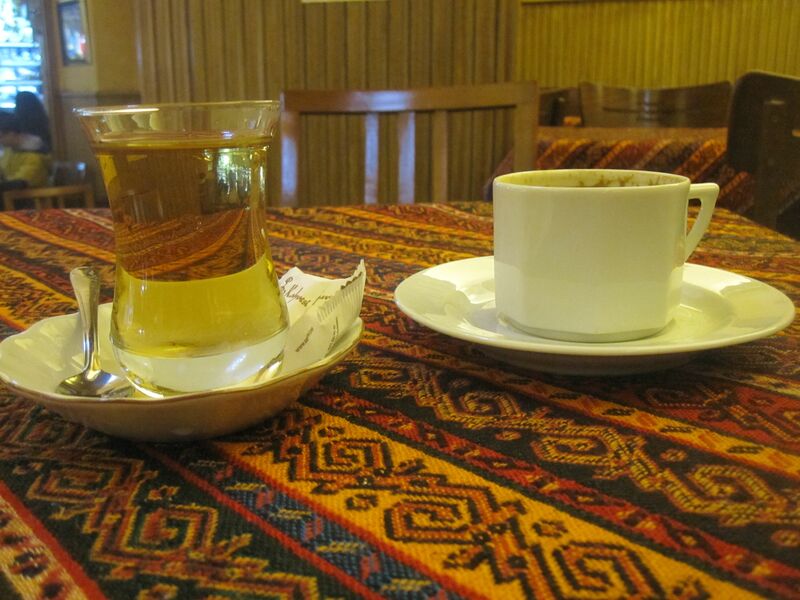 Known for specialty hot drinks, we stop to have a taste. I have apple tea (which basically tasted like squeezed green apple over hot water) in a classic glass mug and strong, delicious Turkish coffee in a tiny espresso cup for the husband. As we walk away a man approaches, “did I hear you say you wanted to buy a carpet?” he says. We smile and continue our walk…this is Istanbul. 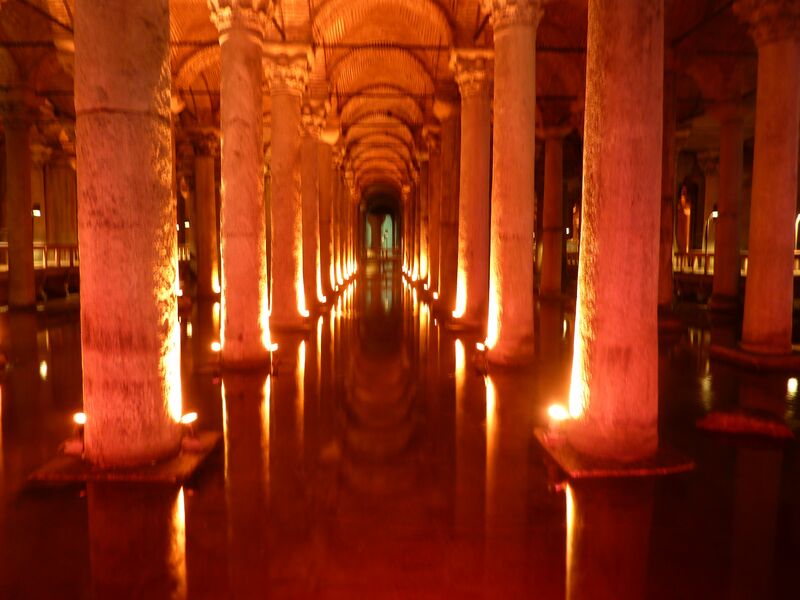 Basilica Cistern: Byzantine history, underground caverns, Medusa heads, magical lights and cool dripping water can be found here in this underground water system built by Justinian in 532. Wooden platforms line our walkway and cool air wafts beside us amidst droplets that come from just about everywhere. This site is a short walk from our hotel and seems to have the shortest queue of all. We spend about a half hour wandering through watching light jump off of the water, dodging drips, in awe of the construction and architectural design. We walk in amazement at history as it comes alive through the monotone voice booming through our audio guides. Spice Market: In a long, narrow building (similar to Boston’s Quincy Market) spices abound. Aromas of saffron, cinnamon and all things tea waft pulling you further inside. Wall to wall with people, the market erupts with noise, accents and a colourful array of scenery. 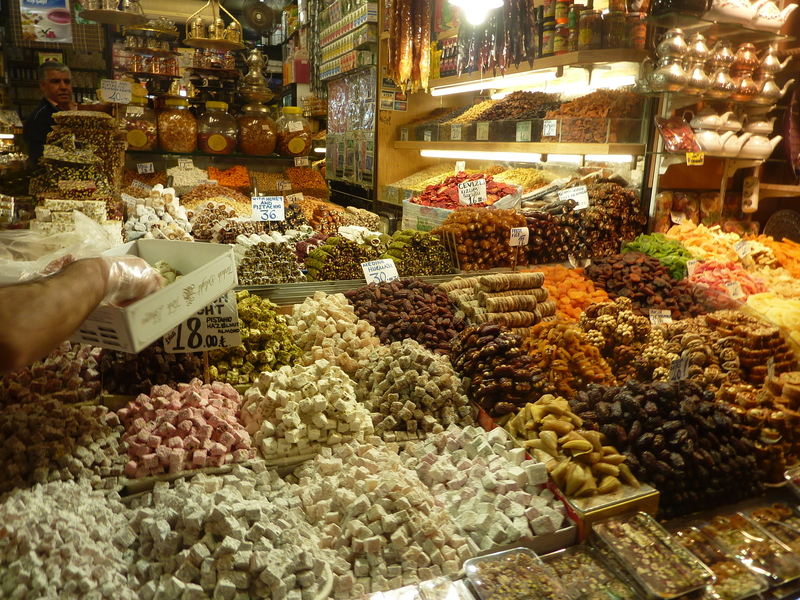 Turkish delights of every flavour imaginable and specialty spices as far as the eye can see line the lane. (TIP: Check the packaging prior to purchasing: be sure it’s all sealed and TSA approved to bring back through customs) In the front of the market there are hundreds of pigeons and an elderly woman who seems to be straight out of the ‘Feed the Birds’ scene in Mary Poppins. No signage (we should have known) leads us to believe it is a kind gesture to ‘feed the birds’ and although it may be kind to the birds, it is a total scam. As the woman keeps refilling our plate to keep the birds satiated, ignoring our question of ‘how much’-when we attempt to walk away “25 Lira” is requested. At the time, it cost us over $10 US to feed the birds. A fun experience…but, very expensive pigeons! 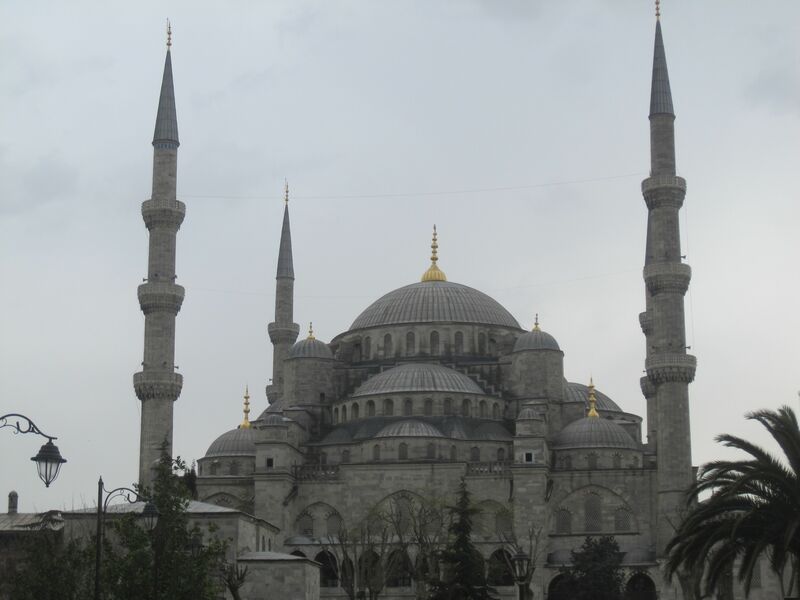 Blue Mosque: The Blue Mosque got its name from western travelers. (TIP: Be aware that both men and women must be fully covered to enter; if you’re not dressed appropriately there is free attire inside. Head coverings for women and waist coverings for men are available. Shoes must be removed prior to entrance.) Women must have their heads covered along with clothing to the wrist and knees, and men must be covered from waist to ankle. Shoes are placed in a plastic bag and carried inside the building. Having just seen Argo (I had to look up and scan the upper levels to see if there was a CIA operative meeting going on-there wasn’t, that I could see anyway) I had an idea of what the inside looked like, but it is even more stunning in person. The colors, stained glass, candles and architecture are brilliant and it’s incredible to think it’s existed for over 400 years. The men have the center of the floor and the women get a small section on the sides. There is an Islamic information center off to the side (where the women stay) with clerics happy to answer any questions regarding building, history or religion. We speak to a man who happily explains some details and answers our questions regarding the dress of observant individuals. It is truly a beautiful and intriguing site. 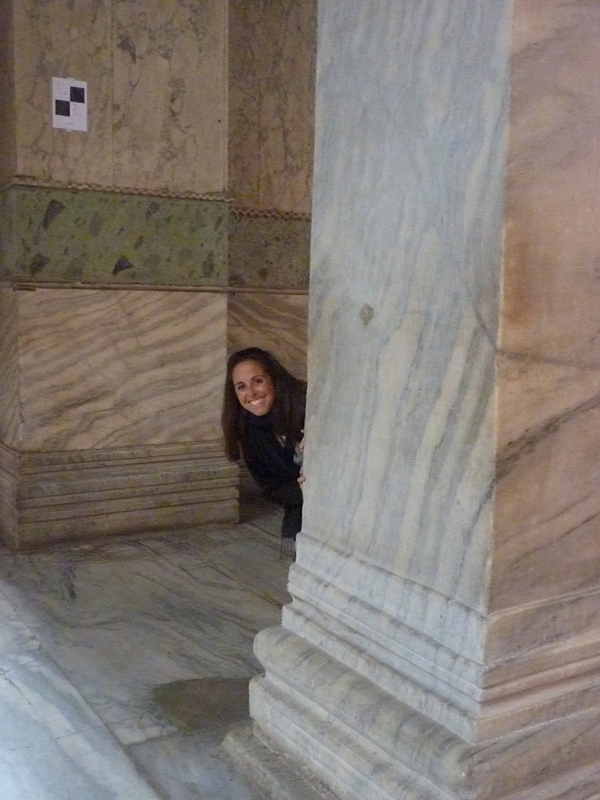 Hagia Sophia: Pronounced Aya Sofia (in Turkish), the name translates to Sacred Wisdom. This building was first built by the Roman Emperor Constantine, and finally finished by Justinian during the Byzantine Empire. The queue is often long and wraps around the outside courtyard. (TIP: Beware of scams taking place along the line where people offer their services as a guide and allow you to ‘jump’ the line). It costs 25 Lira per person (about $12.50 US) to enter if you don’t want a separate guide. The ceilings are incredibly high and gorgeous while well-kept 400-year old artwork and tapestries hang from the walls. 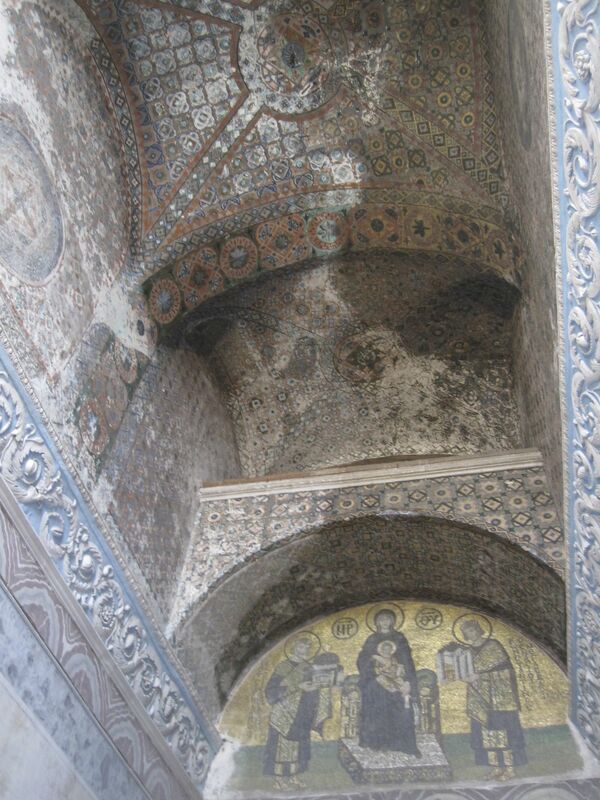 At one time, the Hagia Sophia was a church. Religious artwork and Islamic calligraphy are visible from every angle. We climb stairs, find hidden crevasses and even sit and watch a short video that tells the tales you’d truly find out if those walls could talk. 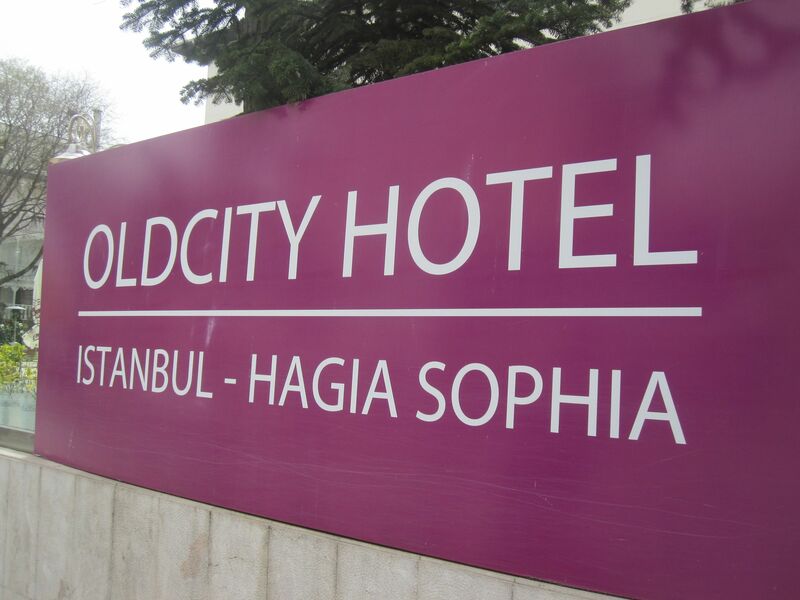 We spend just over two days in the Old City of Sultanahmet, Istanbul. 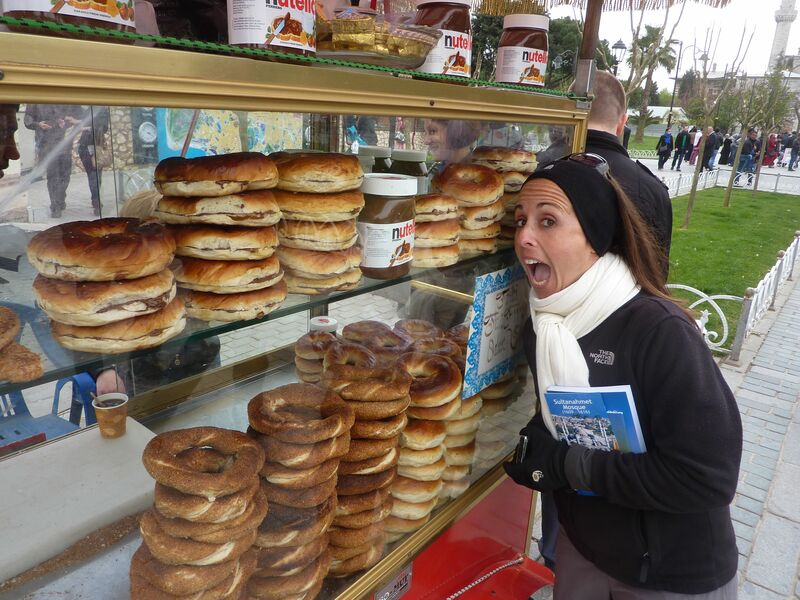 There is much to see, much to eat and even more to experience. I’d return to Turkey in hopes of seeing even more of the beautiful country and perhaps catching a quick day trip down the Bosphorus River over to Romania. I used to teach about Ancient Rome and the change to Constantinople and later Istanbul. Back in high school, my friends used to sing the They Might Be Giant’s song with similar lyrics. Who would have thought one day I’d be standing in the spot where cultures and worlds meet.